You have all seen the rumors, I think there is even a thread dedicated to it. It is 100% true and will be revealed this year. @gcunit Moose probably is not sure about what it is/if it’s happening. I mean, just a few posts ago, he said to take what he said with a grain of salt, which contradicts this statement. Honestly think were not going to see a 2D Zelda this year or for quite some time. 2D Zelda has long been the handheld partner to consoles 3D Zelda and I don't think Nintendo really knows what to do with it especially after the massive success of Breath of the Wild. I think a Wind Waker HD port is the most likely option at this point. I don't see how anything has changed with their 2D releases. Remember that before New SMB Wii the idea of a 2D platformer on a home console again seemed a bit stupid. Then that game ended up selling about as well as the DS release becoming one of the top 10 best selling games of all time. The "portable" 2D Zeldas have fairly consistently sold about as well as their 3D counterparts. All of them being multi-million sellers. In terms of sales performance I'd say Breath of the Wild is in a class of its own, it's the exception rather than the rule. 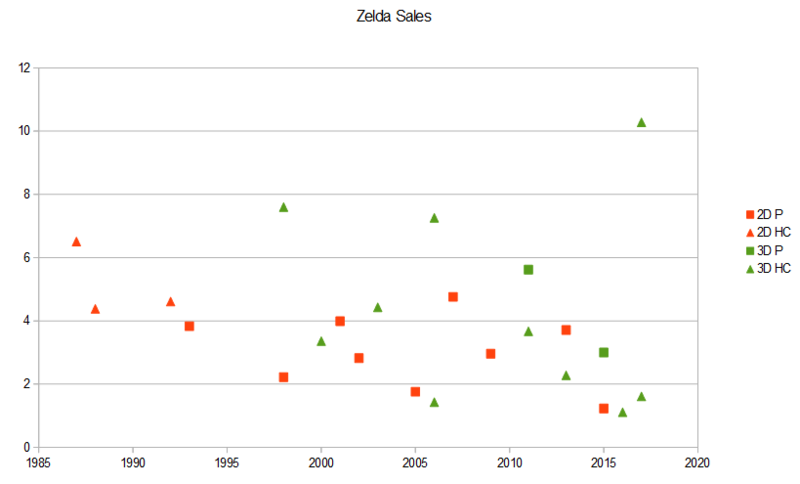 Here's a chart showing the sales performance of 3D vs 2D, Home console vs Portable games for Zelda. Usually a Zelda release, portable and 2D or not, would move between 2 and 5 mill units. Then the flagship 3D release of that generation would do over and above that by some margin. Given the unprecedented success of Breath of the Wild? I would think a 2D Zelda on Switch could easily become the best selling 2D Zelda since the NES. On a more serious note, if there's a Zelda game happening in 2019 I think either Skyward Sword HD for Switch, new 2D Zelda for smartphones or a remake for 3DS that uses the ALBW engine. Oh man! Don't even mention the three super bad CD-i Zelda games! XD But back on topic, I am hoping for a new 3D Zelda that is either like BOTW, OOT or Skyward Sword or Twilight Princess. If Nintendo are struggling with some of their scheduled releases, honestly I'd be delighted if they just did ports of Mario Galaxy 1 and 2 + Zelda Wind Waker, Twilight Princess, Skyward Sword etc. Until their big guns are ready. Never had any of their Wii systems. Will most certainly reuse assets and the dungeons-any-order concept from Link Between Worlds, but other wise new. @rallydefault Are you reporting this or is this just a wish? If it’s the former, what sources are you getting this from? Sources or not it's almost surely going to happen at some point. Nintendo aren't just going to stop making 2D Zelda games when the last effort still moved close to 4mill units... ignoring Tri Force Heroes which doesn't really count. And with the 3DS basically dead at this point that game would be developed for Switch. It's an incredibly safe bet. @skywake No doubt that it’s coming at some point, just not too sure if it would come out this year. I agree that a port of a 3D Zelda is the most likely option rn, but it would be nicer to have even a 2D Zelda port, i.e. A Link To The Past or Minish Cap. We really are overdue for a good 2D Zelda game since Triforce Heroes was a disappointment. That's really not that good for Nintendo though. Especially when you take into account it was an incredibly good game, was the spiritual sequel to a classic, was on a console with a huge install base, AND made good use of the 3D. It frankly should have sold twice what it did. When you then take into account how well BotW sold, it seems entirely likely to me that we wont see another 2D Zelda for a while. The most likely next game will be one that reuses the BotW engine and assets imo. Akin to what Majoras Mask did after Ocarina. Triforce hero was weird in it's reliance on co-op play. I'm pretty sure that really bothered its sales. I never bought it because I have nobody to play it with, let alone two other people at the same time. I'm not interested in playing co-op online with people I don't know. I think my argumentation for not getting this game are pretty mainstream so I'd still say 4m sales is a lot for a game like this. 4 million was referring to A Link Between Worlds. @Dezzy ah yeah I read it too fast sorry. @Dezzy I think exactly the same. And I don't believe it should take them long, so probably for next year we'll already be playing it. That seems overly optimistic. If they want to replicate the huge success of BotW, it'll definitely be over 3 years of development. Depends how much they reuse though. I've said repeatedly they should do a prequel set before the Calamity. That would be quicker to make because it would reuse a lot of stuff. I don't think they will though. I think it'll be something entirely new that just reuses the game engine and the various assets (textures, generic objects like trees, NPC models etc). That's really not that good for Nintendo though. Especially when you take into account it was an incredibly good game, was the spiritual sequel to a classic, was on a console with a huge install base, AND made good use of the 3D. It frankly should have sold twice what it did. Don't read too much into install bases, the attach rate on the 3DS wasn't particularly high and the Switch is doing very well on that metric. Consider this, the Switch has ~40% of the install base of the 3DS but Mario Kart 8 Deluxe has sold ~70% as many copies as Mario Kart 7. With the buying habits of the Switch's audience and the rapidly expanding install base? I'd expect a 2D Zelda on Switch to get closer to 6-8mill units. And in any case, 4mill isn't bad at all especially for a relatively low budget title. It's still well over the sales of Nintendo's second tier of games in terms of sales performance like Metroid Prime, Pikmin, Paper Mario, Kirby, Yoshi. And it's not like Nintendo doesn't see value in revisiting those franchises. It's no Mario Kart but 2D Zelda makes more sense than a lot of games from a sales point of view. And that might be also have been a problem. Maybe people that do not read gaming outlets thought they would need to have played the first game. Especially when the game page calls out the it being set in said word, some people might have worried. According to this ( https://www.nintendo.com/games/detail/the-legend-of-zelda-a-l... ) article the purchase rate of the original A Link to the Past was (just) 4.61 million. So having the sales of roughly 4 million is wonderful news for a sequel, that late. Sure we can now assume that more people bought / played Zelda, given the Virtual Console on Wii, but I would wager there will be a lot of overlap with the install numbers of those who bought it for Super Nintendo Entertainment System. Also look at previous sales, Spirit Tracks sold an "abysmal" ~3 mil and Minish Cap, which was also a Top Down Zelda game that got high accolades sold only a "measly" ~2 mil despite the install base on GBA being higher than the 3DS. Also look at the overall handheld numbers, going ONLY 10 years back from its release, it A Link Between Worlds did wonderful, with only Phantom Hourglass eclipsing it. @skywake i agree that a 2D Zelda is going to sell well but i cant help but feel that a number of factors are going to mean the series is going to mean were not going to see it make an appearance for quite some time. Firstly i imagine the developers are going to be focused on 3D Zelda, especially after the success of Breath of the Wild. I mean that game captured the attention of a wide audience including many who haven't bought in to the franchise for years, if at all, and I think Breath of the Wild has made the franchise exciting again to a lot of people and Nintendo will want to satisfy the fans of this game and build on that success. Breath of the Wild has created an expectation amongst Switch owners about what the series can provide and i think a lot of people would see a new 2D Zelda as a step back and I just think the number of people who are interested in a 2D entry are dwarfed by the amount of people looking for a Breath of the Wild continuation and at the end of the day Nintendo would be foolish to slow the momentum of the franchise by limiting the appeal to the smaller 2D fanbase especially when in all likelihood those 2D fans are still going to buy a 3D entry. Then there is the personal wishes of the developers. Breath of the Wild was an incredible success from a gameplay point of view and i imagine the developers probably still have a mountain of ideas they were not able to implement that they would be itching to include in a sequel. 3D Zelda and the power of the Switch allows them to create a world and scenarios on a scale they have not been able to before and i am sure they are as excited as the fans are to see what they can do with the tools at there disposal. There just seems to be so much potential with 3D Zelda at the moment and so much that can be done and i think it would be a poor move for Nintendo to limit the team by pushing 2D Zelda for the sake of having 2D Zelda on the Switch. I do enjoy the 2D Zelda games and i would not want to sound like im hating on it but i think in terms of where they could take 2D Zelda there are few options. A new 2D Zelda would be awesome but i cant see it being much more than a shinier nicer looking version of what has already been done. I am sure it would be fun but its not exactly innovating on the same scale as the 3D counterparts. I mean from a development point of view what could be done with 2D Zelda?? What can be done that is fresh and exciting?? A Link Between Worlds had some nice ideas but did any of them help push it to the next level in terms of sales?? I don't remember seeing people be excited over rental items and the non linear approach to dungeons. I don't think a 2D Zelda would take long to develop but could the developers handle developing a 2D and 3D Zelda side by side?? The best outcome i could see is Grezzo, who have a good history with the franchise and who with Ever Oasis have shown they can make a good original game, could develop a 2D release while everyone else is focused mainly on the 3D release. I could envision Grezzo maybe taking things down the route of mobile or mobile/Switch which is not necessarily a bad thing. I think porting Wind Waker HD would be a good and really easy way to keep everyone invested in the series while work on a follow up continues. It might not be on the same scale as Breath of the Wild but Switch owners not familiar with the series are going to find more to like with Wind Waker HD than they are in a 2D Zelda. Just some random thoughts over a morning coffee. Im no analyst just throwing some thoughts out there and believe me i would love to see a 2D Zelda but right now and for the Switch seems like the wrong place and the wrong time.